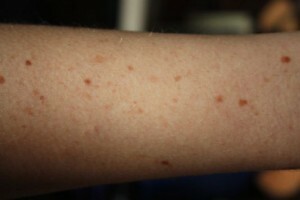 Counting moles on your right arm can help in assessing someone’s risk of developing skin cancer. The little pink ribbon symbolises Breast Cancer Awareness Month, a time when public focus and support turns to all those suffering from breast cancer. It is also important in raising awareness of the disease which will affect one in eight women in their lifetime. It is essential that women attend routine breast screenings and check their breasts regularly because early detection can mean a difference between life and death. While examining your breasts is important, so is checking your moles on your arms. Besides breast cancer, skin cancer is the most commonly diagnosed cancer among women. Melanoma is a form of skin cancer that starts in or near an existing mole. It produces skin cells called melanocytes. These cells become abnormal coloured spots on the skin. Therefore the risk of being diagnosed with melanoma is linked to the number of moles a patient has. Anyone can get melanoma, young or old, melanoma does not discriminate. However, those who are very fair skinned are more at risk of developing melanoma. The good news is that when it’s found and treated early, it can be cured. The American Cancer Society estimates that 73,870 Americans will be diagnosed with melanoma in 2015, while 13,000 people in the UK are affected by the disease yearly. A new study carried out by researchers from King’s College London found that people with 11 or more moles on one arm were likely to have a higher risk of developing the melanoma type of skin cancer. Females who had more than seven moles on their right arm were likely to have more than 50 on their whole body and those with more than 11 on their arm were likely to have more than 100 on their body which predicts a higher risk of developing skin cancer. There are, of course, other risk factors that can influence the development of cancer such as sun exposure, tanning beds and your family history of cancer. It’s important to get to know your skin: the shapes and sizes of your moles, freckles and birthmarks for example. The American Cancer Society says you should be aware of asymmetry, border irregularity, colour variation, changes in size, bleeding and itching. Now that doesn’t automatically mean that you have skin cancer if you have a weirdly shaped mole. It’s good to check with your GP if you are uncertain about it; it’s better to be safe than sorry. Fo r those, especially the fair skinned, who have moved to the sunnier places of the earth or spend a lot of time in the sun, it is advised to check for skin irregularities every month. While sun exposure stimulates the production of Vitamin D in the skin, prolonged sun exposure increases the risk of melanoma. You don’t need to hide from the sun completely. The best way of enjoying the sun while protecting your skin is to wear protective clothing such as a long-sleeved shirt, sunglasses and a hat. It’s better to stay out of the sun between the hours of 10 am and 3 pm as this is when the sun’s rays are strongest. 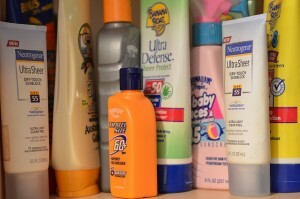 Also you should add applying sunscreen to your daily habits, just like brushing your teeth or washing your face. Choose a product labelled “broad spectrum” that protects against UVA and UVB rays, both of which can cause cancer and choose an SPF 15 or higher. Remember to apply it to the easy-to-miss spots like your lips, ears, around the eyes, neck and scalp. I know it’s easy to forget to reapply sunscreen as often as necessary, but suffering five or more sunburns increases your risk of developing melanoma. Receiving the news that you have cancer is everyone’s worst nightmare. As an expatriate, it’s even more difficult when you are hundreds of miles away from family and friends. On top of that the diagnosis can also have a devastating effect on your finances. It’s important therefore to find out whether your policy covers you for cancer treatment and what is included in this coverage. So do yourself a favour and get to know the skin you’re in to avoid any unpleasant surprises while living abroad.